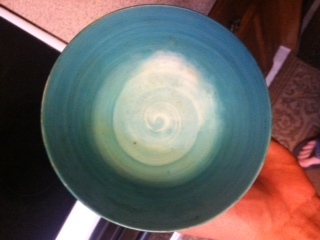 Found this bowl in my great aunt's house and don't know anything about it. I was just seeing if it looked Asian to you or not. 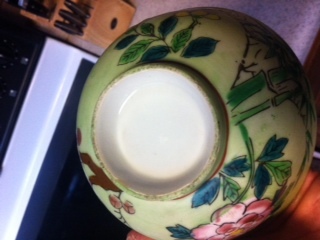 There aren't any marks on it or anything and it did not seem modern to me because of how thin it is and the wobbly rim of the cup. I doubt it is antique but it would be nice to know something about it's origin. Thanks in advance. Not sure about this. In my view it is either newer (vintage) Chinese or Japanese. The whirl in the center picture points to Japanese, the foot rim looks more Chinese.